The mind is a collection: the figure shows up repeatedly. The mind is a library, cabinet, or a museum; it is a treasury, repository, or workshop. It might be a book, a blank page, or a desk of drawers. Perhaps it is a series of medals, a lodging house, or a pen full of wild animals-- or a calculator, a control center, a central executive, a computer. The philosophers tell us again and again that this is nonsense-- and I'm inclined to agree. There is (they say) no final line in the mind, no screen where ideas pop up, or frontier that separates there from here. Yet, there is a catch. Despite the fact that claims like these have been overwhelmingly, repeatedly, and even routinely discredited, the figures of thought cling on, continually turning up in philosophy and folk psychology alike. Some of the most powerful voices speaking against these sorts of dualisms have themselves noticed the difficulty (see for instance Daniel Dennett, Consciousness Explained); even if we accept that we are speaking nonsense, it is hard to know how to talk about mental activity without falling back on metaphors like these. I'm interested in why perfectly intelligent, more-or-less functional people stick to a batch of metaphors that have seemed so obviously discredited. And this includes most people; we wind up allowing these figures to sneak into our thinking. Surely, the hunch goes, there is a reason for this, that might be elucidated in everyday habits and practices of thought. This museum attempts to pry open this problem from a material point of view. 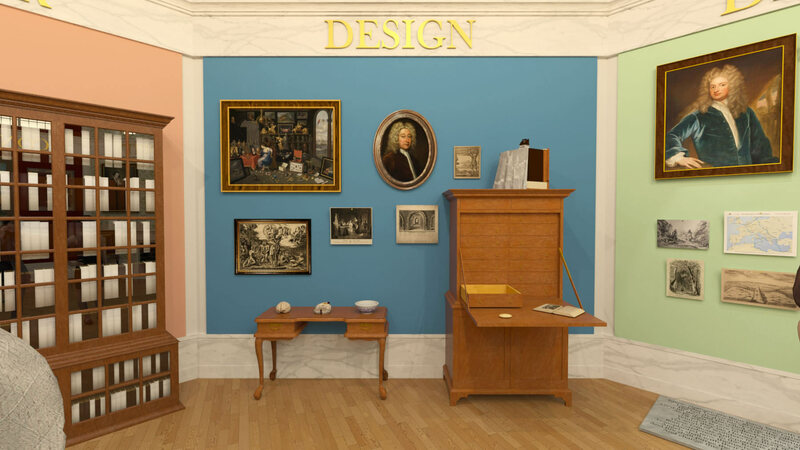 It displays some of the objects and working spaces that provided the figures for making sense of cognition. Thinkers have repeatedly discovered in various enclosed spaces the working models for theories of the intellect. In other words, people repeatedly use observed objects and spaces in order to buttress distinctions between self and other, mind and its objects. These are metaphors, but they are more than metaphors (a point discussed in the first space in this museum)-- in part because these figures rest on real, material places where the figures were worked out with all their force and vigor. In other words, dualisms like these are constructed in working spaces of thought. The lines between inside and outside are justified through a paradoxical blurring of those very lines; we mark a distinction between mind and object precisely by turning objects into thoughts. This case examines some important instances of things paradox, staging objects that gave rise to theories of mind. “An Instrument of Use to take the Draught, or Picture of any Thing,” in Robert Hooke, Philosophical Experiments and Observations (London, 1726). Courtesy University of Michigan Special Collections. Painter Joshua Reynolds owned a camera obscura that folded up into the shape of a book. Image courtesy Science Museum, London (AN 1875-28). Physician Thomas Willis pioneered the techniques to lay open the delicate, ringlike vascular structure in the core of the brain. Photo by Curator, from Cerebri Anatome (1664). Marcantonio’s engraving of the Judgment of Paris, from the design of Raphael (1511–1513). H,2.24 © Trustees of the British Museum. Jan van Kessel the Elder, Kunstkammer with Venus at Her Toilette-- one of many similar paintings produced, factory-style, in the studios of Dutch and Flemish artists. AN 2797 © Staatliche Kunsthalle, Karlsruhe. One of five fall-front cabinets, containing the oldest-known complete mineralogical collection. Image courtesy Sedgwick Museum of Earth Sciences, Cambridge. Pope's converted a foot-tunnel on his property into a mineralogical collection. Photo by Curator, used with kind permission of Radnor House School. Sir Kenelm Digby compared the agitated mind to a bowl full of currants. I was curious what that would look like. Photo by Curator.